Does Anyone Actually Care About the Oil Spill or "We're Doomed"
I live in pretty much the most liberal area of Virginia--Arlington County. All five of our County Board members are Democrats, the voters overwhelmingly vote for Democrats for state and federal offices, and most of my neighbors and friends would characterize themselves as politically liberal. I suspect most of them would also characterize themselves as environmentalists who care about their impact on our environment. All of them would express concern about climate change and the US's profligate use of oil and fossil fuels. And they all most certainly are outraged by the BP disaster in the Gulf of Mexico. A week ago a friend of my daughter invited her to go swimming at the local pool. According to Google, it's 6/10ths of a mile on foot. She and I walked over. As I was leaving I noted a neighbor from my block dropping off her daughter at the same pool in her minivan, and I watched her get back in and drive home. Another of my neighbors works in a building less than 900 yards from her house. Yet most days she drives to work. In another case, a neighbor has a 16-year old son who works in a local five and dime. The establishment is about 8/10ths of a mile from their home. On most occasions, they drive over to pick him up after work--even on days with beautiful weather. We needed to provide our house key to a neighbor's daughter so she could care for our cat. I called over to their house and her father said he would come right over and get the key. A couple minutes later he drove up. They live 800 feet away!!!! If this is how environmentalists take to heart the need to change our habits and protect our environment, then we are most certainly doomed. Desdemona Despair uses the tag line "Blogging the end of the world." And, unfortunately, it kind of is. The blog seeks out and prints everything it can find on how we humans are destroying our good planet. 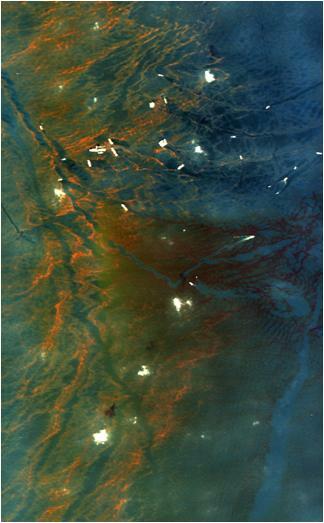 From deforestation, to chemicals to climate change, you can find your favorite disaster here. The name Desdemona refers to the character in Shakespeare's Othello (Othello's wife), who needlessly dies in the end because of the unwise actions of others. For some people it can be easy to dismiss one or another environmental issue for some reason, but after spending time on Desdemona Despair, the larger picture becomes clearer, and the need for significant and immediate action on every front becomes apparent. Annie Leonard has added a new video to her series that began with The Story of Stuff. Using the same line drawn animation and straightforward storytelling, this video takes us through the history of bottled water and the significant negative impacts it has on our environment. There are other videos in the series, which I encourage you to watch. I disagree with much of what is included in the Story of Stuff: Cap and Trade video, however. The United Nations Framework Convention on Climate Change (UNFCCC) is the international treaty that was established at the Rio Convention in 1992. It spawned the International Panel on Climate Change, which is charged with synthesizing the established science of climate change and report regularly to the Framework. Boring stuff. However, the UNFCCC maintains a section of its website called Feeling the Heat, which is nicely written summary of climate science, its causes and effects. It is somewhat out of date--not having been updated recently (see Climate Progress for quick reactions to the latest science), but covers the topic clearly, comprehensively and intelligently. More recent climate science indicates that the likely effects of climate change are more severe than what is written in Feeling the Heat. Nonetheless, the basic concepts are there, from a source that is supported by the majority of nations on the planet. The UNFCCC website is public domain, so if you find language there that you think is well turned, you may use it. 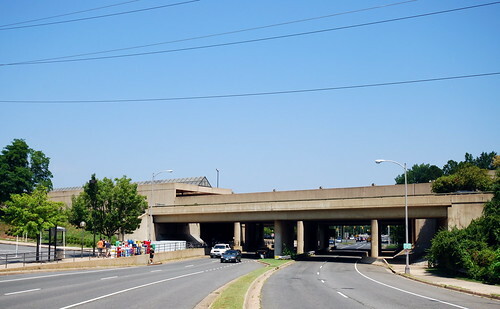 The pedestrian bridge near Seven Corners in Fairfax County opened in May of 2009. Last year I posted twice regarding this feature (here and here). I recently went back to visit and do another count of bridge users. Here are the results, along with the counts from 2009. Each of these represents one hour of counting during the middle of the day, and the weather was similarly pleasant on all three days. Based on this simple count, it appears that traffic is about the same on the bridge, with roughly half the observed pedestrians and cyclists crossing at Patrick Henry. This seems sensible to me: the bridge would represent a long detour for many people whose destinations are closer to Patrick Henry Drive. For this count there was only one person who made the mad dash across Route 50. That is fewer than before, although my statistical sample is pretty small. I find it surprising that few cyclists use the bridge. Perhaps more use it during commuting hours. My counts have been in the middle of the day. Early problems with the bridge have been mostly resolved. The trash cans appear to be regularly emptied and the graffiti is almost all painted over. The biggest problem is that the stairwells are used by loiterers--presumably at night (they were not there while I was there). 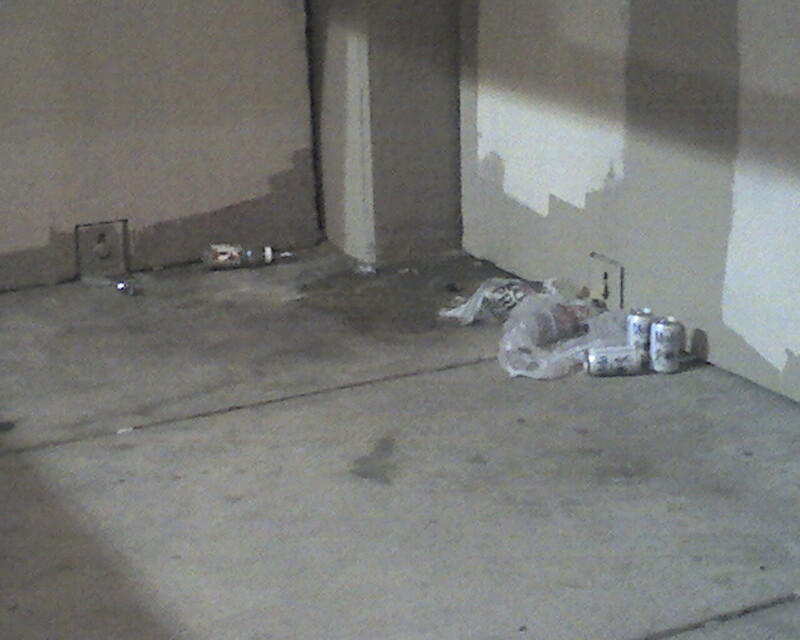 They leave behind beverage containers (alcoholic and non) and the stench of urine. For future designers, I might recommend a more open architecture that would allow visibility from all angles. The ramps, which are open, are nice and clean and feel safe. The stairwells, which are mostly closed in, have litter and feel a bit less comfortable--probably much more so at night. All in all, this bridge is a worthwhile complement to the transportation infrastructure in the area. I use it myself, and find it to be quicker and safer than my previous alternatives. However, much more needs to be done. As with last year, the walking routes to and from the bridge are completely insufficient--essentially nonexistent. The crossings at Seven Corners itself need to be redesigned to accommodate pedestrians. The busy crossing at Patrick Henry is still dangerous. And of course, the entire area could use a long-term strategic plan, so that opportunities to improve it are not missed as various development and redevelopment occurs in the area. ---------------------------- Skeptical Science is a website and blog devoted to cataloging and responding to the arguments that are brought up in the media and elsewhere that run counter to the view that climate change is happening and that humans are responsible. The web site is run and maintained by John Cook, an Australian. The goal of the web site is to explain what peer-reviewed science has to say about climate change and apply it against the arguments that are frequently seen in the media and on the web. Currently he catalogs 114 of these arguments. The site does not get involved in any of the political arguments. The home page is an active blog that focuses its discussion on the science of climate change. This blog is widely read--so much so, in fact, that Christopher Monckton, the infamous climate denier, has recently responded directly to a post on the site. Arlington County , VA, where I live, is making improvements to the water infrastructure. As I understand it, they are cleaning and lining the water supply lines systematically across the county. I applaud the county for being proactive in preserving and extending the life of this vital infrastructure. As the workers laid temporary water pipe in the streets in my neighborhood, I noted that there were several locations where they allowed the water to gush out, as shown in this video. The water was gushing out into a pail that had holes cut in it, so that it would then flow away in the gutter. You can see my hand holding a watering can and filling it up with the flow. It took about 13 seconds to fill it to the 2-gallon mark. I calculate that flow to be a little more than 9 gallons per minute, 550 gallons per hour, 13,000 gallons per day. This was not, I should note, the only location where this was happening, although the flow at other locations I noticed was not quite as much. The part of this that bothered me was not that the workers needed to set these temporary pipes as part of the maintenance program. It was that this was put in place several days before Memorial Day weekend, and the water kept gushing 24/7 before, after and through the entire 3-day weekend. I believe it was at least 10 days total that this gusher was in place on my street. Roughly 130,000 gallons from just this one spot. Water rates in Arlington are $11.74 per 1000 gallons, so the opportunity value of that water was about $1,500. Another way to evaluate is that Arlington pays Washington Aqueduct $795 per million gallons. From that perspective, the 130,000 wasted gallons only cost the county $150. Makes one wonder about the difference. Given that these crews have been working for many months, I would not be surprised if several million gallons of water has literally been washed away. The County, in fact (and ironically), maintains a water conservation tips page. There must be a better way to do this, particular on weekends and holidays. Obviously the contractors have no incentives to conserve the water. The county, though, does, since it has to pay for it. Also, it makes residents like me wonder how the county is working to conserve our resources and tax dollars when this simple, easy to see, wasteful practice is occurring right in front of our houses. Following on the heels of carsharing, now dominated in the US by ZipCar, bike sharing programs are springing up all over. As we transform our cities to be less car dependent, providing as many other options as possible becomes a key strategy for making those cities function well and providing for higher quality of life. Bike sharing is a strategy that fits within that transformation paradigm. The Bike-Sharing Blog is the best resource for keeping up to date on bike sharing around the world. Paul DeMaio, Founder of MetroBike LLC--a bike-sharing consultancy, runs the blog. His daily work keeps him engaged on the front lines of bike sharing, and we are fortunate to have him share the latest and greatest with us. Metro responded to my suggestion for Orange Line shuttle buses I posted over at Greater Greater Washington. During Memorial Day weekend and the following two weekends, Metro is suspending Orange Line service between East Falls Church and West Falls Church and replacing them with shuttles. My original post suggested a different set of shuttles than just one between those two stations. Thank you for your May 25, 2010 email message to Richard Sarles, General Manager of the Washington Metropolitan Area Transit Authority (Metro), with suggestions regarding Orange Line shuttle service during our upcoming closures between East Falls Church and West Falls Church Metrorail stations. Mr. Sarles always welcomes input from our riding public and asked that I respond to your suggestions. When planning for service disruptions, we keep several priorities in mind: customer convenience, service reliability, funding availability and clear communications. One shuttle would cost less to operate than running multiple shuttles with multiple station destinations. It was the most cost-effective option and we are committed to using our resources wisely. Travel time for multiple shuttles would be heavily impacted by traffic on I-66, which is subject to numerous delays (predictable and unpredictable) especially during the holiday weekend. Without delays on I-66, travel time would most likely be equal. Communicating the operation of one shuttle is less confusing to the customer. The one-shuttle method most resembles a 'normal' commute on the Orange Line. If you have multiple shuttles, there are more opportunities for people to board incorrect buses, thus creating more frustration and inconvenience for our riders. For these reasons, we have opted to operate one shuttle. However, we will evaluate the shuttle operation after this weekend and make any adjustments necessary to minimize customer inconvenience, maximize our funds, preserve service reliability and maintain clear communications for subsequent work. I will ensure your input is considered in the evaluation process. I hope you find this information helpful. Again, thank you for your suggestions. I was pleased that I received a thoughtful response. Kudos to them. I suspect that their cost analysis did not include the cost savings from not running the trains. I find it hard to believe those savings would not be fairly large. Whatever shuttle system they operate will need to transport the same number of passengers (all of them), so the alternate system would only need to be marginally larger to make for better customer service, not outrageously larger.